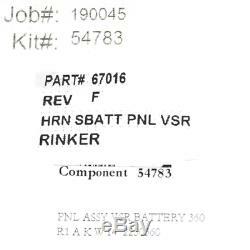 Boat part number 1074255 is a new OEM battery circuit breaker and switch panel for a 2014 Rinker 360 model Boat, part number 67016. This OEM panel is constructed from black powdered coated aluminum with a textured finish. Measures approximately 10" W x 16" H overall. There are (8) approximately 1/4 Dia. Mounting holes spaced 9 1/2 apart center on center. Host wiring assembly part number 54783. Tag on panel reads: PNL ASSY Battery 360 Specifications. Overall Dimensions: 10" W x 16" H. Holes spaced 9 1/2 apart center on center. (1) Hatch Override - Positive Turn style knob. (1) Hatch Override - Negative Turn style knob. (1) Amplifiers - Press-to-Reset push-button breaker witout push-button just breaker 70A 250VAC 32VDC. 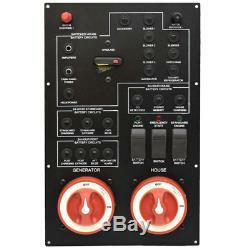 (1) Cabin Panel Power - Press-to-Reset push-button breaker 70A 250VAC 32VDC. (1) Helm Power - Press-to-Reset push-button breaker 50A 250VAC 32VDC. (1) Accessory - Press-to-Reset push-button breaker 10A 250VAC 50VDC. (1) Blower 1 - Press-to-Reset push-button breaker 5A 250VAC 50VDC. (1) Blower 2 - Press-to-Reset push-button breaker 5A 250VAC 50VDC. (1) Blower 3 - Press-to-Reset push-button breaker 5A 250VAC 50VDC. (1) Macerator - Press-to-Reset push-button breaker 20A 250VAC 50VDC. 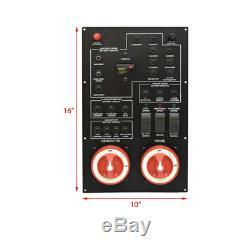 (1) Blender - Press-to-Reset push-button breaker 15A 250VAC 50VDC. (1) Hatch Ram - Press-to-Reset push-button breaker 15A 250VAC 50VDC. (1) Cockpit Refrigerator - Press-to-Reset push-button breaker 15A 250VAC 50VDC. (1) Windlass - Buss breaker push-button 48V DC. (1) Starboard Charging - Press-to-Reset breaker 50A 250VAC 32VDC. 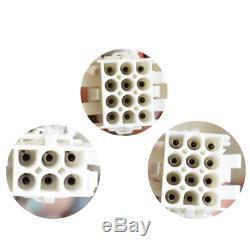 (1) Starboard Cathode - Press-to-Reset breaker 10A 250VAC 50VDC. (1) FWD Bilge - Press-to-Reset breaker 6A 250VAC 32VDC. (1) Port Charging - Press-to-Reset breaker 50A 250VAC 32VDC. (1) Port Cathode - Press-to-Reset breaker 10A 250VAC 50VDC. (1) AFT Bilge - Press-to-Reset breaker 6A 250VAC 250VAC 50VDC. (1) High Water Alarm - Press-to-Reset breaker 3A 250VAC 250VAC. (1) CO Detectors - Press-to-Reset breaker 3A 250VAC 50VDC. (1) Stereo Memory - Press-to-Reset breaker 15A 250VAC 50VDC. (1) House Charging - Press-to-Reset breaker 50A 250VAC 32VDC. This OEM panel features the following items. (1) Indicator Illuminated Green Light - Momentary Off/On Momentary On/Off Port Engine / Battery Rocker Switch. (1) Indicator Illuminated Red Light - Momentary Off/On Emergency Start Rocker Swicth. (1) Indicator Illuminated Green Light - Momentary Off/On Momentary On/OffStarboard Engine Battery Rocker Switch. (1) Generator - On/Off Single Circuit Turn-Style Breaker - 48V 350A 600A CONT. (1) House - On/Off Single Circuit Turn-Style Breaker - 48V 350A 600A CONT. Customers please note every computer shows colors differently. Hardware and instruction / installation manual not included. A Message from Great Lakes Skipper. We stand behind our products and maintain great relationships with our customers. The physical address you provide must be deliverable by ANY service of our choice. Don't live in the US or Canada? No need to feel left out. You may also reach us using the Ask a Question link at the top of the page. Feel free to send us a message any time! 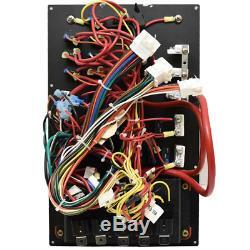 The item "Rinker Boat Battery Switch Panel 67016 360 Black with Breakers Aluminum" is in sale since Tuesday, January 29, 2019. This item is in the category "eBay Motors\Parts & Accessories\Boat Parts\Electrical & Lighting". The seller is "greatlakesskipper" and is located in Racine, Wisconsin. This item can be shipped worldwide.